Students must have a Federal Student Aid ID to apply for Aid. If you do not have one, you may CLICK HERE to create one. Download the Application (MS Word) and CLICK HERE to download information letter on this scholarship opportunity. WUE is a program of the Western Interstate Commission for Higher Education (WICHE). Through WUE, students in western states may enroll in 150 two-year and four-year college institutions at a reduced level. Member states include: Alaska, Arizona, California, Colorado, Hawaii, Idaho, Montana, Nevada, New Mexico, North Dakota, Utah, Washington, Wyoming, and the Commonwealth of the Northern Mariana Islands. Scores from the PSAT/NMSQT are used to determine eligibility and qualification for the National Merit Scholarship Program. The Preliminary SAT (PSAT) is a standardized test typically taken by 10th and 11th graders as a precursor, practice SAT test. 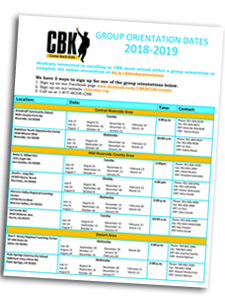 All 10th graders in CBK will have the opportunity to take the PSAT test free of charge on Wednesday October 10, 2018. The RCOE Foundation Scholarship is an annual scholarship open to students in RCOE programs who will earn their high school equivalency (GED or HiSET) or their high school diploma and will be attending college. who have a college acceptance letter or enrollment confirmation. FAFSA application submission opens on October 1, 2018. For many Cal Grant state financial aid programs the deadline submission date is March 2nd, with some community college Cal Grants submission deadlines being September 2nd. And the Federal FAFSA deadline June 30th. National Merit and National Achievement Scholarships are entered by taking the Preliminary SAT (PSAT test). All 10th graders in CBK will have the opportunity to take the PSAT test free of charge on Wednesday October 10, 2018. Additional SAT & ACT testing dates are listed on our College & Career resource page.